I was in hibernation as the wind turned cold and the days got short, making each day a mad dash from one warm place to another. Packed, moved, unpacked yet again and in between all this my poor blog lay neglected, without a kind glance..
Today is Ground Hog Day, so I definitely had to post.. a day made memorable for me by the classic movie of the same name wherein the Bill Murray gets stuck in Punxsutawney, PA and relives the same day over and over over again till he... Well..watch the movie if you can. This is the day when a poor ground hog in Punxsutawney, PA comes out of its hibernation and see a mass of people waiting to see his reaction..
" According to folklore, if it is cloudy when a groundhog emerges from its burrow on this day, then spring will come early; if it is sunny, the groundhog will supposedly see its shadow and retreat back into its burrow, and the winter weather will continue for six more weeks." Apparently, spring is coming early.. the days are already getting longer.. So why am I so excited..? Well, for one.. this signifies the beginning of the end of the frosty day!! Yahoo! !This has been a relatively mild winter with intermittent spates of freezing cold.. to think positively, if there was no winter, where would I wear all those sweaters and scarfs? And also for me the last one year has been like reliving the same day over and over again..Get up, pack lunch, drive, work, cook, clean, eat... all verbs, with no fun adjectives to sprinkle around it. Like a scene from the movie when the hero finally knows the day and road so well that he automatically dodges a pothole and avoid getting splashed on, have fine tuned the day activities to a semi-automatic form. So have to pay homage to the movie and day that I use as a analogy for what our routine sometime becomes!! Is it like that for everyone? And what's better in this weather than to turn on the oven and roast something with the pretense of cooking while in actuality you just want to heat up the house further. The warmth and the aroma both make this a quick reach for in our house. I grew up three recipes for cauliflower.. Alu Gobi (Potatoes and cauliflower curried together), Gobi Parantha( Flatbread stuffed with cauliflower) or Cauliflower thoran (Shredded cauliflower steam cooked with coconut). 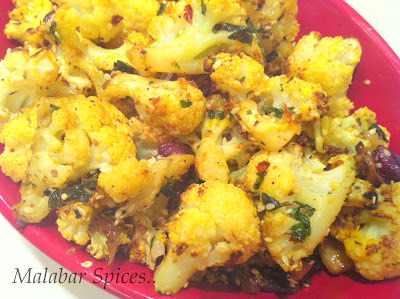 Spouse refused to espouse the Alu Gobi and over time I forgot how to make it, much as it is a favorite for most. But this roasted cauliflower was adopted with open arms and since it doesn't involve cooking, gets made more often. It is a healthy vegetable , a cousin of the broccoli family.. its known to lower your risk of cancer, and it is full of antioxidants, has anti-inflammatory properties and is loaded with fiber. Cut the cauliflower into florets and wash the florets and drain well. Line a large roasting pan or tray pan with foil. Place the cauliflower florets and onion dices in it. Pour the olive oil all over the cauliflower, and sprinkle the salt, turmeric, sesame seeds, chili powder, cumin powder and cilantro and mix well with your hand. Add the garlic cloves too. Place the saute/roasting pan in the oven and cook for 20-30 minutes, checking and stirring to ensure even roasting. Garnish with more chopped cilantro and serve immediately while still warm. Sprinkle a pinch of garam masala if you like. Use only salt , pepper and finish off with parmesan cheese. Use only sambar masala and salt. There is no fun in blogging anymore. Once upon a time, there were few blogs and there were few bloggers and being food crazy was frowned upon. Hence there was this thrill in writing lustily about a particular recipe, as if you just stumbled upon its virtues,as if it changes your life (it may have!! ), as if you were the only one in the world who could make it well and photograph it like never seen before, tempting lots and lots of readers who still haven't discovered the secret. What secret, you ask? Well the secret is that dear readers, anybody can cook and just like any other skill, the more u cook, the better you become....But now there are sooooooooooo many blogs.. that there is no need for me to blog anymore. I can spend my days surfing on others blogs and see and enjoy the thrill in the younger blogs while I secretly miss the old hats whose blogs lie still and dead, gathering dust like the empty tharavadus in Kerala. I wish all these bloggers would wake up and blog once more, just to see some new words from them..just for a new line of conversation... not for the recipes which abound everywhere. Between the frozen aisle which imports everything u miss, to the multitude of new bloggers, there is no recipe left to cover now. Its just versions and versions...which is really what a recipe is... a version of a food played out in your family, customized to your family's tastes. Rant apart, an old standby which is the best way to get spinach into my kids, though my better half refuses to touch it..:) Palak Paneer, which is fried cubes of cottage cheese in a spiced up spinach gravy. Some fry the paneer, some toss it with tandoori spices and grill it, some put in bland... it works any way..just don't add cream to the final gravy , Ala restaurant style. Paneer cubes - 15-20 . Cumin Seeds -1/2 tsp Tsp. 1. You could use fresh or good quality frozen spinach. Since this is one leaf that soaks up all the insecticides and stuff sprayed on it, use organic as much as possible. Spinach if bought as fresh bunches from the farmer’s market or the Asian stores has a lot of sand on it. Soak the spinach in a large vessel with water for 10 minutes and rinse each leaf well under running water. Do not stint on washing it well. The sand can destroy all your hard work! If you are using pre-washed spinach, you could cook it as it is. Wash & drain the water from Spinach. Chop them coarsely. 2. Heat 1 1/2 tbsp of oil in a non stick pan and sauté the paneer pieces till light golden on all sides. Take care not to leave the pan unattended as it gets burnt quickly. This should take about 2-3 minutes. Drain onto paper towels and keep aside. 3. Cook the spinach with the ginger, green chilies, ½ cup water and one clove of garlic in a pan till soft. If using a pressure cooker, cook for one whistle only. When it cools down, blend the cooked spinach to a coarse paste using a hand blender or food processor. Use quick pulses to avoid blending it to a paste. 4. In the same wide pan heat the remaining oil, fry the chopped onions till translucent. Add the remaining garlic and sauté. Add the spice powders, 1 tablespoon of water and sauté for a minute. Take care not to burn the spices. Add the yogurt and when the liquid in it dries up add the blended spinach paste and salt. 5. Cover and let it simmer on medium heat for about 10 minutes and add the paneer cubes. Let it cook for another 5-6 minutes to combine the flavors, check seasoning and add the tablespoon of cream. It should be slightly tangy and spicy. Add a pinch of garam masala before serving. Do not add any additional water for blending. The spinach should be coarse but should not be fibrous. Do not add any water while cooking the gravy. The gravy has to get thickened on medium heat so the more the water, the more time it will take and it will dilute the flavor of the spinach. Add tomato instead of yogurt in the first cooking of the spinach for the tanginess. The dog days of summer.. long hot days, humid days, a handful of thundershowers.. well.. any day a better summer than last year's wet, unseasonably cold summer. Someone left a comment saying, " its summer outside my window" and I just realized my bog is still showing fall!!! Well, long hours of work and managing the house doesn't leave time for blogging anymore but I had to change the fall picture!! Now its Ramzan season and all thoughts of food are centered around the traditional for me at least. Ramzan's fast is a loooong day here this time and barely any time left to do the 2-3 courses of food after breaking fast. Guess we have to wait a long time before wee get winter fasts here! Ramzan, Iftars..and Plantains..go hand in hand for me..
How many ways can you eat the humble plantains? Ask a Keralite/Mallu..
Pazham Narachathu/Plantains stuffed with coconut and sugar, or scrambled sweet egg. Pazham Porichathu/ Plantains dipped in batter and fried. Pazham Vattiyathu/ Plantains cut and sauteed in ghee. Pazham Ulathiyathu/ Scrambled Plantains with coconut and sugar. Unnakayi/ Mashed Plantains stuffed with coconut. This one above is the simplest way to satisfy a dessert craving.. Slice Plantains into slices horizontally or vertically. Heat 2 tsp of Butter/Ghee and saute the plantains for 2-3 minutes on each side on medium heat. When they look golden halfway through the thickness, flip them and cook the other side. Sprinkle sugar and let it melt and as it starts crusting, remove and serve. Traditionally , the sugar is sprinkled after the plantains are removed onto a plate, but the slightly crusted sugar also tastes yum. Don't ask if you can saute this in olive oil or vegetable oil to make it healthy...its not really meant to be.. it's meant to be enjoyed in moderation. It's Fall outside my window, yellowed leaves falling constantly, spreading a golden carpet in the woods behind, denuding the trees one leaf at a time. A burst of color everywhere, but this time the hues tempered down by the unseasonable onset of snow. So the brilliance is low and slowly the grey is pervading everywhere. The malls are fighting back with their slew of bright colored winter sweaters and jackets, as if that will ward off the quietness and stillness already around. There is a playground outside my house, which lights up when it sees kids but that's only when the sun is shining bright on it.. the rest of the time, it looks so forlorn and empty... as if the kids vaporized instantly. Maybe I should do a chicken sacrifice to appease the Fall gods into extending the glorious Fall season. Chicken Legs were a favorite growing up, with a fight ensuing for them over the dinner table with my siblings, since the chicken in those days had only two legs. :) Nowadays the chicken (at least here) can have as many legs as they want, since its just a matter of ordering more of them at the Halal shop. You can buy just the thighs, just leg quarters, just the white meat, just wings.. if u pause to think of it, (which the kids don't,) they would wonder why the chicken has so many legs! It used to be that meat was a luxury, with every part of the whole chicken being used fully to ensure that it was worthwhile. The good meaty parts went into frying and the bony parts went into a curry or stock. And indeed, a curry tastes way better if its made with a mix of dark and light meat, bony part et all than just white meat or dark meat. So for curries, I still get the whole chiken cut up, but for grilling and baking , this is better with even sized pieces which evens out the cooking time. Now it's a convenience, with chicken being cheaper than vegetables, with us buying whatever suits our needs more. Mix all the dry rub ingredients together and keep aside. Wash and dry the chicken pieces, with or without the skin on. I grilled it with the skin on and the skin just crisps to a crisp crunchy layer, which you can discard later if you want. The chicken should be dry and then score it twice and rub the dry rub generously all over the chicken. Let it marinate in the dry rub for an hour or so and then grill. Place a thin layer of oil on the foil lined tray before placing the chicken on it and place it in a preheated 400 F oven for 20 minutes. Then cover the chicken with the foil and let it bake for another 10 minutes to let the inside get cooked. Increase the heat to broil setting and open the foil and let the chicken crisp up to the broiler for about 5 minutes and you are done. 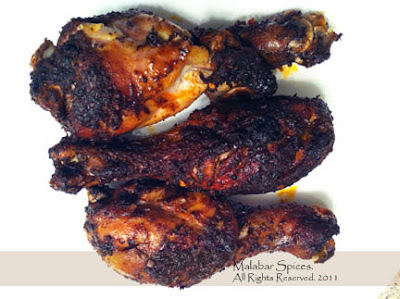 Some chicken may take less time if they are smaller.. check for doneness after 20-25 minutes. Serve with flat breads and humus.